As mentioned earlier, Cooksonia, a plant that has been historically regarded as the oldest vascular plant, is included in this group. Compressed specimens have been described from localities all over the world, including North America, Great Britain, North Africa, Europe, Siberia, and South America (e.g., Fig. 8.59). 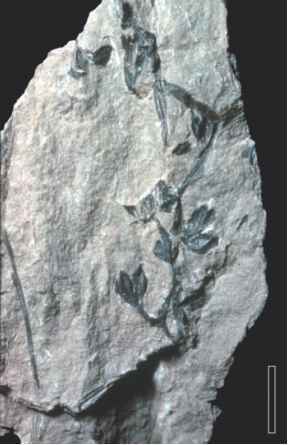 Some Cooksonia specimens discovered in Wales are known from deposits as old as the Ludlovian; other specimens suggest that the taxon extended into the Early Devonian (Emsian). Sporangia thought to belong to Cooksonia have been described from Wenlock (mid-Silurian) rocks (Edwards and Feehan, 1980). Cooksonia hemisphaerica, from the Upper Silurian of Wales consists of dichotomous branches up to 6.5 cm long with axes 1.5 mm wide. 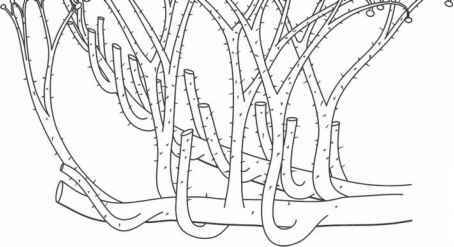 Stomata occur along the aerial axes (Edwards, 1979). Sporangia are terminal and vary from hemispherical to spherical; in C. pertoni and C. downtonensis , sporangia are wider and longer. In C. caledonica, the shape of the sporangium is highly variable. None of the specimens shows a distinct dehiscence mechanism and all plants were apparently homosporous. One might suggest that all of the Cooksonia specimens described to date merely represent the distal branches of a much larger plant. The uniform sizes of the many specimens described thus far, however, favor the interpretation of Cooksonia as a small plant. More recently, a larger specimen interpreted as Cooksonia was described from the early Lochkovian (Upper Devonian) of Brazil which includes five orders of dichotomous branching (Gerrienne et al., 2006). Several hypotheses are offered as to whether the specimen represents a sporophyte, a gametophyte, or a sporo-phyte arising from a thalloid gametophyte (prothallium). 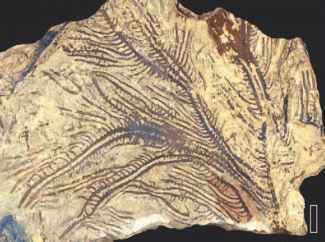 understood represent a highly artificial group of plants that existed during the Late Silurian-Early Devonian, and that may include forms that are ancestral to either bryophytes or vascular plants, or possibly both. Uskiella (FIG. 8.60) is used for both permineralized and compressed cooksonioids from the Lower Devonian of southern Wales. They have naked, simple isotomous branching and ellipsoidal sporangia (Shute and Edwards, 1989). The sporangial wall has several cell layers thick, with a longitudinal row of thin-walled cells along which the sporangium splits (Fanning et al., 1992). The spores have been described as alete and range from 28-42 pm in diameter; they possess a two-layered sporoderm. Another genus that morphologically resembles Cooksonia and Uskiella is Dutoitea (Rayner, 1988). Several species have been described from Lower Devonian (Lochkovian?) compressions of Cape Province, South Africa. Some axes show a thin median line that may represent a conducting strand, perhaps even that of a bryophytic level of organization. In at least one specimen, multicellular spines are present on the axes. Nothing is known about the spores. In the cladistic analysis of Kenrick and Crane (1997a), Hsua (FIG. 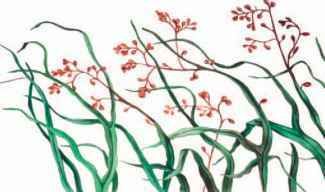 8.61), from the Middle Devonian of Yunnan, China, is included among the zosterophyllophytes. This simple plant consists of main axes ~ 1.0 cm wide that divide to produce lateral branches, some of which terminate in reniform sporangia (C.-S. Li, 1982). Stomata occur along the stems in H. robusta together with tubercles. In the center of each axis in H. deflexa (FIG. 8.62) is a terete, centrarch protostele with G-type conducting cells (D.-M. Wang et al., 2003a). Spores range from 18-36 pm and are trilete. In H. deflexa from South China, spines are present along the axes (D.-M. Wang et al., 2003b). 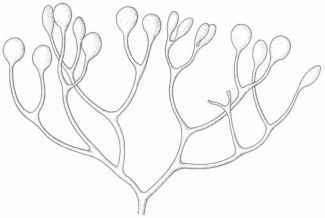 Although features of Hsua suggest affinities with the cookso-nioids, the pattern of branching and features of the sporangia are strikingly similar to that found in some zosterophylls. sterome. Sporangia are elongated (2.5 mm) and the surface is striated. Nothing is known about the sporangial contents. Hedeia corymbosa consists of dichotomizing axes, each terminated by an elongated sporangium (Cookson, 1935). The specimens, which are Early Devonian in age, are not known in sufficient detail, so features of the sporangium and spores have not been described. Specimens of Yarravia also consist of the distal ends of dichotomizing branches, and may represent a preservational state of Hedeia (Hueber, 1983). In Hedeia the fertile axes show some similarity to that found in the trimerophytes. Another cooksonioid is Salopella (Edwards and Richardson, 1974). 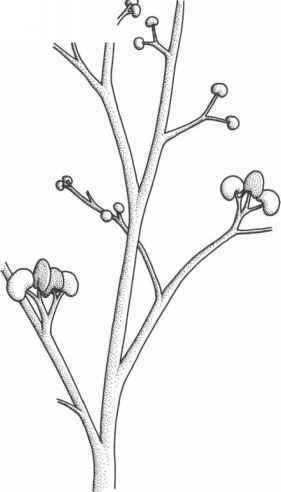 It consists of compressed, naked, dichotomously branched axes up to 2.0 mm wide which bear terminal sporangia (Larsen et al., 1987). The trilete spores are all of the same morphological type and described as azonate. At the present time the spores are sufficiently different to allow Salopella to be distinguished from other rhyniophyte taxa (Edwards and Fanning, 1985). Eogaspesiea gracilis is the name given to tufted, dichotomously branched axes up to 10.0 cm long (Daber, 1960a). 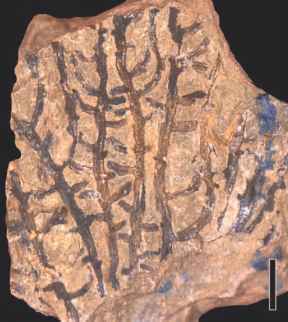 This Early Devonian taxon includes a tangled mass of axes believed to have been attached to a rhizome. At the end of some of the axes are elongate sporangia, each up to 2.5 mm long and containing thin-walled, perhaps alete spores. that bear single sporangia in a lateral position on the axes. Stockmansella remyi from the Eifelian of northwestern Germany consists of a system of prostrate, aboveground axes up to 10cm long and 3.1mm wide which repeatedly bifurcate and are characterized by a central xylem strand consisting of S-type cells (Schultka and Hass, 1997). These basal or rhizomatic axes produce narrow laterals at right angles; these may turn upward and become smooth, erect axes. The rhizomatic axes also produce arrested laterals positioned in the axils of bifurcations and irregularly distributed sporangia arising from nonvascularized pads (sporangiophores) that are attached laterally to the main axes. Sporangia are elongate or ovoid, up to 2.2 mm long and 1.0-2.2 mm wide, and dehisce by one to several longitudinal fissures. Prostrate axes, whether main axes or laterals, produce scattered rhiz-oid-bearing bulges on all sides. of varying diameters. On the inner surface of each tube is a series of helical thickenings that represent a component of the primary wall rather than being secondarily deposited. The wall in these tubes has three parts, consisting of an inner microporate layer, a middle spongy zone that constitutes the majority of the cell wall, including the helical thickenings, and an outer fibrillar layer. H-type branching, and sporangia borne on elongate stalks are features found among more than a single group of early land plants. Whether H. gracilis represents a plant which is transitional between the rhyniophytes and zosterophyllophytes or is intermediate in a line leading to the trimerophytes is yet to be determined. The Early Devonian (Pragian) plant Huvenia also has what are interpreted as flattened axes (Hass and Remy, 1991; Schultka, 1991). The axes often bifurcate and bear small protrusions interpreted as rhizophores. The conducting stand contains S-type elements. 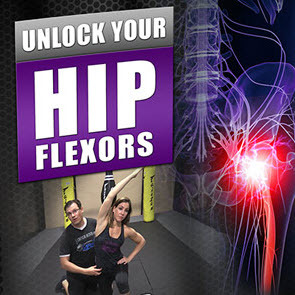 Twisted fusiform sporangia (FIG. 8.66) are attached to stout sporangiophores and borne on the primary axes near branches. In a specimen of Huvenia sp. from Gaspé, Hotton et al. (2001) describe sporangia attached to small branches. Small disks associated with the specimen are interpreted as vegetative reproductive units. It is unknown whether the twisted configuration of the sporangium reflects a postmortem change, the actual morphology, or structural variation perhaps related to periodic drying. Spores of Huvenia from Gaspé are compared to the sporae dispersae taxa Retusotriletes or Calamospora (Hotton et al., 2001). to 30.0 cm tall, and consisted of a pseudomonopodial main axis to which were attached lateral branches dichotomizing several times and terminating in reniform sporangia. The spores measure 46-70pm in diameter and are trilete. Although a few helical-scalariform conducting elements have been recovered in macerates, virtually nothing is known about the conducting system. Terminal sporangia and pseudomonopodial branching are features that suggest affinities with the rhyniophytes, but the large, reniform-shaped sporangia (with dehiscence along the distal margin) are characteristics common to members of the zosterophyllophytes. plant (Geng, 1986; Cai et al., 1996). The plant includes naked, compressed branching systems, some up to 40 cm long, that produced closely spaced, interdigitating laterals (FIGS. 8.68, 8.69). Cells macerated from the main axis show tracheid lumen casts with circular-bordered pits. A more recent reexamination of this fossil within its depositional environment concludes that it represents a rooting system, rather than aerial axes, based on the two dimensionality of the branching systems and the endogenous origin of the laterals (Edwards et al., 2007). 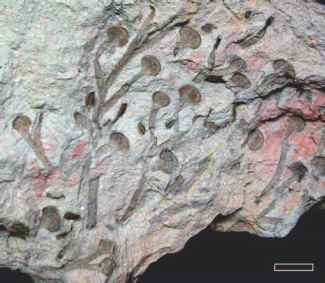 Detailed analysis of the matrix suggests that although the specimens are fossil, they probably represent roots of a geologically younger (?Permian) extinct plant that grew into the Silurian rocks below and subsequently became fossilized. The rhyniophytes have traditionally occupied the position of the oldest and simplest vascular plants. Many authors, including Banks (1975), have suggested that the rhyniophytes gave rise to the trimerophytes. As new information becomes available, however, it is clear that some of the so-called rhyniophytes are not true vascular plants, but share features of both bryophytes and vascular plants; these plants have been accommodated in an artificial group, the cooksonioids, until we know more about some of these early forms. From the foregoing section, it should be apparent that although these Late Silurian-Devonian plants share many features, they include so many plesiomorphic characters that it is difficult to include them in higher taxonomic categories. In addition, the information on conducting elements from exceptionally well-preserved specimens like Aglaophyton major suggests that some of our concepts about early land plants with conducting tissues may be in need of modification. Now that gametophytes are known in at least some of the rhyni-ophytes, their structure and morphology may help to define broader whole-plant concepts leading to a more robust classification of many of these plants. Even in specimens lacking anatomy, some morphological characters suggest a bryophytic level of organization; it is important to keep in mind, however, that tissue systems, like various organs (e.g., leaves and roots) were evolving as plants adapted to a new, terrestrial environment. The fossil record suggests that conducting elements may have evolved in more than one group and at different times during the early colonization of the earth (Taylor, 1986; Kenrick et al., 1991a). Not all of these elements were true trac-heids, but they apparently functioned like tracheids in that they not only had to provide support (mechanical stability), but also function in translocation, an idea suggested many years ago by F. O. Bower and later by H. P. Banks. Some of these plants may represent the ancestral stock of certain bryophyte lineages and others may be true vascular plants, but the majority may simply represent failed attempts in the colonization of the land. As additional specimens are discovered and new information evaluated, there are certain to be additional modifications and refinements of our understanding of these plants. Rhyniophytes are certainly some of the simplest, upright land plants, but are they the oldest? As you will see later, zosterophyll and even lycopsid megafossils are now known from the Upper Silurian in some diversity. At the present time, the oldest megafossil evidence demonstrates parallel evolution of rhyniophytes and zosterophylls; unfortunately, the spore record currently provides few characters that would enable us to distinguish these early plants from one another, as all contain simple trilete spores. In addition, few are known with spores in situ, which would provide for correlation of sporae dispersae with parent plants and demonstrate plant diversity prior to the Late Silurian.